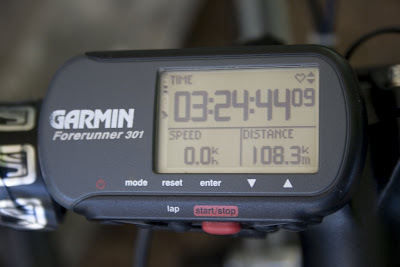 The time and distance that I've managed to covered. The race started around 8:12am and it is already hot. It's gonna be a hot day. I started middle outside pack so that I wouldn't be left behind in case they started to attack early. Everyone managed to stay within one group for the 1st lap and it took us 48:26 minutes. There were a few short sprint but everyone managed to catch up. After the 1st lap, that's where the action began. Just right after the corner climb at JP, they started the attack leaving some of us off guard and was left behind. We tried to catch up but they were already too far in front. I guess there was around 7 t0 10 riders left behind. I tried to catch up the main group, I thought the rest of the riders would follow me instead they were left behind. So I was alone. 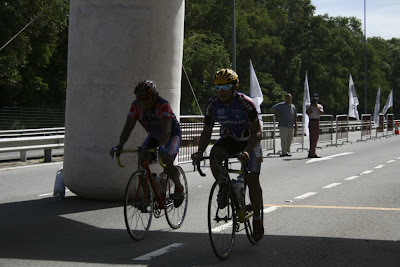 However, I managed to catch up two riders at Highway Rimba. I guess they are too tired to follow the faster riders. By the time we reached the highway at Lambak Kiri, there were 5 of us - 2 Temburong, 1 ABDB, 1 police and me from Brunei Muara. We managed to stay together until we reached the 2nd lap where some of the riders decided to give up cause they were running out of water. I was very lucky compared to other group cause my support crew always make sure that I have enough water. Other rider was not very lucky as I am, since their support crew only give high priorities to the front riders. Thats why many back riders have to pull out of the race due to lack of water supply. kesian kesian. 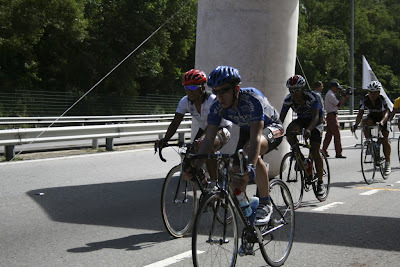 At first I decided to give up on the 3rd lap but I decided to continue since a few riders infront of me continue their ride. Finally I gave up when I was all alone. When I reached UBD, turnaround and headed back to B.Shahbandar. Raihan - Finished top 10. Two races (Xcountry & road race) and both of them DNF - disappointing results. Tapi ada sedikit dapat dibanggakan. I managed to beat a few riders who have been practising longer than I am. 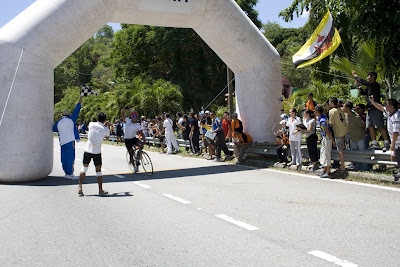 To the senior riders (orang lama), they managed to keep up with the younger faster riders. It shows that they still have the strong will power to complete the race plus the experience and knowledge they have. I have a very high respect for them. On a personal note, Running and Cycling - I would prefer running. It is much easier and so far all the races that I have entered, I've finished it. But not to worry, I heard there is another bicycle race coming soon in July/August in conjunction with His Majesty's Birthday. Hopefully this time I'm fully prepared and finish the race. 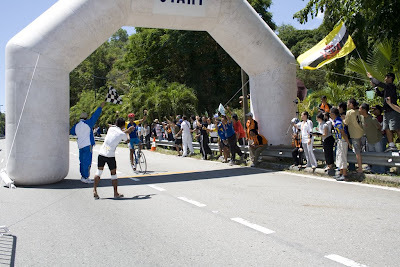 Brunei Half Marathon and Brunei Triathlon is coming soon. So I need to train especially swimming. Congratulations to Ahmad Fathi. 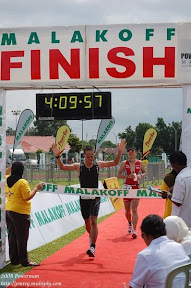 He has successfully completed his full triathlon at the recent Sarawak International Triathlon at Miri. He only did breaststroke style for his swimming and managed to complete the swimming part around 45mins. If he can do it, I can do it. I salute you dude. I've heard many stories from Brunei triathletes that as long as you don't panic and have high will power, you can successfully completed the swimming in any style - breaststroke, backstroke, kampung style or whatever style. Some also have breaks in between the swims by hanging on the water buoy just to get some rest and air.